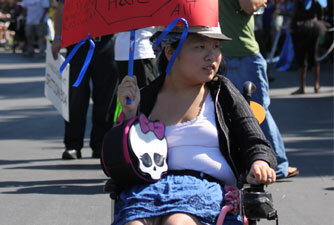 Photo of organizer in San Jose for Disability Pride Parade. In 1997, the California Foundation for Independent Living Centers (CFILC) was awarded a federal grant to build a statewide Disability Organizing Network to educate and organize California’s Disability Community. From 1997 to 2002 CFILC employed 29 Empowerment Team Leaders that worked within the 28 Independent Living Centers through the state. In 2003, we embraced a new model, one that moved the funding and employment of Empowerment Team Leaders to their local Independent Living Centers, and changing their title to Disability Organizing Advocate. This set the stage for stronger local advocacy strategies and community involvement. 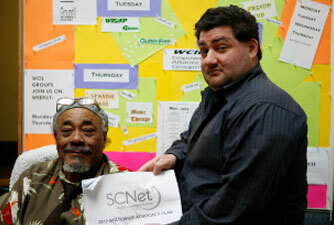 The Disability Organizing Network has had many organizing and advocacy successes some of which include increasing the accessibility of polling places, increasing awareness about the lack of access to electronic voting machines, increasing access to airport shuttle services, homeless shelters, domestic violence shelters, housing, transportation, assistive technology and durable medical equipment and medical supplies and healthcare. In 2012, the Disability Organizing Network is moving into the social networking world with the launch of this DOnetwork website, and we are focusing on organizing local initiatives statewide. We are building local action teams to support the implementation of Olmstead through increasing access to accessible, affordable integrated housing, increasing access to accessible and affordable transportation options, promoting the inclusion of Disability History in California Schools, increasing awareness of about the frequency and impact of bullying on youth with disabilities, increasing civic participation through non-partisan voter education, voter registration and get out the vote activities. The Disability Organizing Network is working to include people with disabilities in the discussions that impact their lives. The Independent Living Movement is organizing and growing, reminding the world: "Nothing about US without US!" An organized community resembles the people who make it up. It starts small and grows, developing the talents and skills of its members. 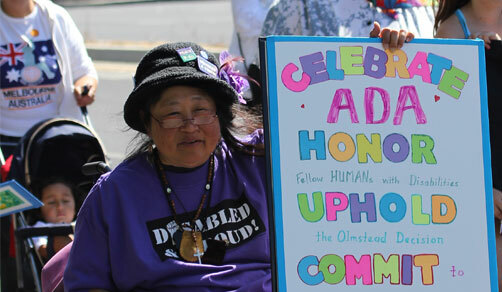 The Disability Organizing Network works to grow the disability community to be recognized amongst decision makers in California. Please join DOnetwork to build a larger and more effective Independent Living Movement in your community by clicking here to contact your local Disability Organizing Advocate. Please help us build a larger Independent Living Voting Block by contacting your local Disability Organizing Advocate. Opportunities to expand peer services, business opportunities and jobs for people with disabilities. Disability rights organizers will carefully assess all of the opportunities, as well as the challenges, involved in this system re-design. Advocates will work to protect what is strong in the current system, while staying open and engaged to all possibilities of positive change. The Disability Organizing Network Advocates are collaborating with the California Foundation for Independent Living Center's program Youth Organizing (YO!) Disabled & Proud around issues that impact youth and California's schools. YO! Disabled & Proud has organized youth-led campaigns such as Disability History Week, Taking Action for Accommodations and OWN MY POWER: Freedom from Bullying. Photo of volunteers and staff at an independent living center. Together with YO! Disabled & Proud, the DOnetwork Advocates are partnering in a joint Schools Committee to continue this work and increase mentorship within the Disability Community in California. Currently, stakeholders from the DOnetwork and YO! Disabled & Proud meet regularly about implementing disability history in California's schools at the local level under the FAIR Education Act. Become a stakeholder in California's Independent Living future by clicking here to contact your local YO! Disabled & Proud Volunteer and Disability Organizing Advocate.